Quinoa is a high-protein grain that has been grown in the Andes Mountains of South America for hundreds of years. 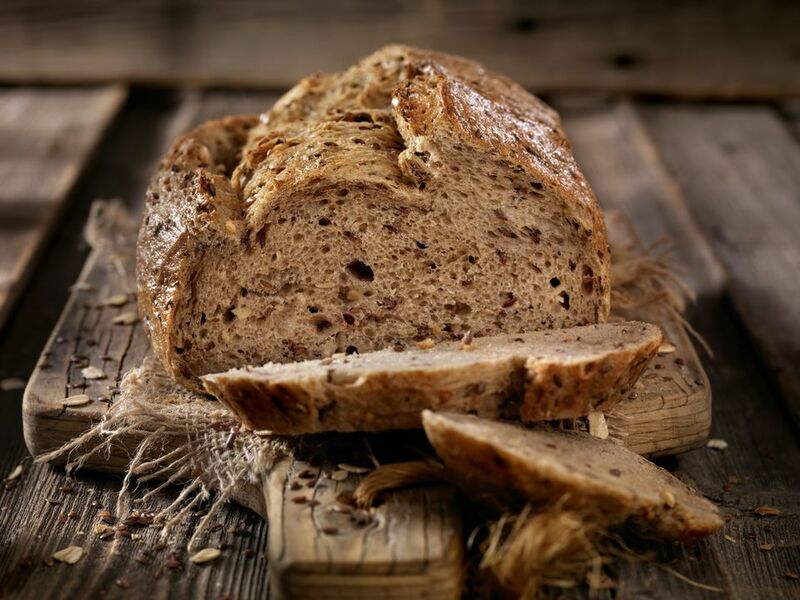 Recently "rediscovered" for its nutritional properties, quinoa adds a pleasant chewiness and slightly nutty flavor to this wholesome bread. A slice of this high-protein, high-fiber quinoa bread for breakfast will easily tide you over until lunchtime. This bread stays moist for several days, slices well and is great for sandwiches.d stays moist for several days, slices well and is great for sandwiches. Cook the oatmeal in 1/4 cup water and 1/4 cup milk until the liquid is absorbed. Let cool. Place 3/4 cup warm water in a large bowl or bowl of a standing mixer and sprinkle the yeast over the water. Let the yeast rest for 5 minutes. Stir the honey, vegetable oil, powdered milk and sourdough starter (if desired) into the yeast mixture with a wooden spoon or with a dough hook on low speed if you are using a mixer. Add the whole wheat flour and 1 cup more of the bread flour and stir. When the dough starts to get stiff, turn it out onto a floured surface and begin to knead. If you are using a standing mixer, continue to knead with the dough hook. Keep adding flour and kneading until the dough is smooth and elastic, about 5 minutes with a mixer, or 10 to 15 minutes by hand. The dough should feel slightly sticky but should not be wet and slack. You should be able to form it into a ball, and it should hold its shape. Lightly oil a large bowl with vegetable oil and place the dough into the bowl, turning to coat it lightly with the oil. Cover loosely with plastic wrap. Let the bread dough rise in a warm spot until it doubles in size, about 2 hours. Oil a large loaf pan, 11 x 6 inches. Punch down the dough and shape into a ball. Pat and flatten into an oval shape about the length of the bread pan. Fold the long sides in and tuck them underneath as you place the bread into the pan, so that the top surface of the bread is smooth and without seams. Brush the top of loaf very lightly with water and sprinkle with quinoa seeds. Let the dough rise in warm place until it has almost doubled in size. When the oven is hot, place the bread in the center of the oven. Throw a handful of ice cubes into the bottom of the oven to create steam. Cover the bread loosely with foil if the top is getting too brown and bake 15 minutes more. Bread should sound hollow when tapped. Remove the bread from the pan and let cool completely.